I thought it might be interesting to have a look at my own, admittedly rather minor, brush with model ship action compared with the more usual subjects this website is concerned with. I have trawled the archives and dredged up a long forgotten commercial which I worked on at Mirage effects in Sydney Australia in 1987 . I had never seen the actual spot until recently, when I did a casual search on youtube 26 years later. 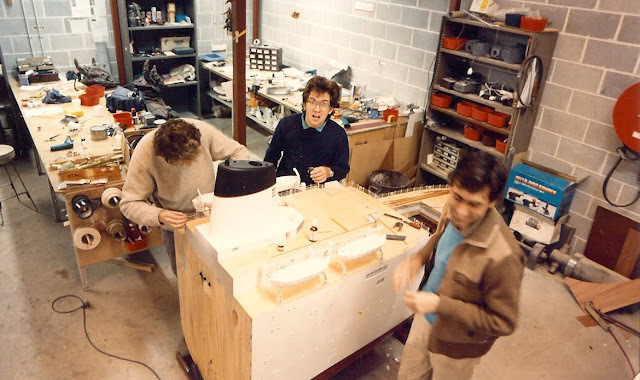 At that time Mirage effects was the premier special and visual effects facility in Australia ( there is a new Mirage effects in Sydney which bears no relation to the place I worked at way back then) . Mirage then had its own motion control camera, back lit bluescreen, optical printer, black and white matte processor, motion controlled matte stand, rotoscope camera stands, studio, lighting, front projection rig etc etc and most importantly model workshop where I contributed to models, miniatures and props with a bunch of other crazy fools who were just as mad about doing that kind of work as I was. 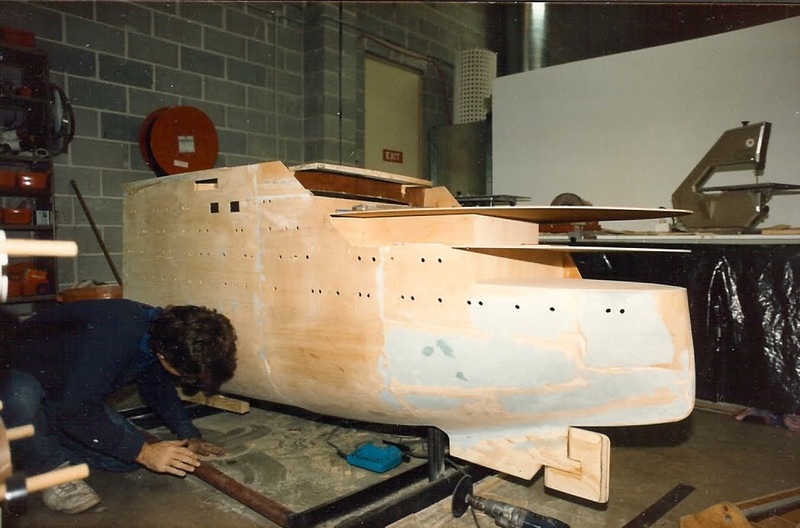 It lasted just one year before Mirage then closed its doors and I moved to sharing a workshop with two of the modelmakers for a further 2 years. I can honestly say that it was the best fun I've ever had in my life. I had moved nearly 3300 kilometres across the country from Perth Western Australia to work on a Cleopatra soap commercial. They would only guarantee me work for 6 weeks. Lucky for me it worked out well and I continued onto other jobs. Mirage Effects was the only time I have ever walked into a place and instantly felt like this was where I belonged. I felt right at home and really enjoyed the camaraderie with the other modelmakers and FX guys. It was also the best special effects education you could get as we did everything from models, miniatures, props, rigs, floor effects like smoke machines and wind machines and set dressing for the more sci-fi oriented subjects. When we weren't building stuff we were laying on the floor of the studio switching lights on and off manually as the motion control camera trundled down its track and covered the models in black tape for the front light back light matting technique. We would be cooked by the heat of all the lights needed for a high speed shot and freeze in a quarry for night shoots. We operated the miniatures for the model shoots and the rigs live on set. We were crammed in to corners of sets just out of shot to operate a bit of equipment or a rig, or were up on top of the set pulling things on wires. I loved every minute of it. Strangely enough it was some model ships I had built as an industrial modelmaker that got me the gig in the first place as the Cleopatra spot needed an ornate model barge to hold the soap. 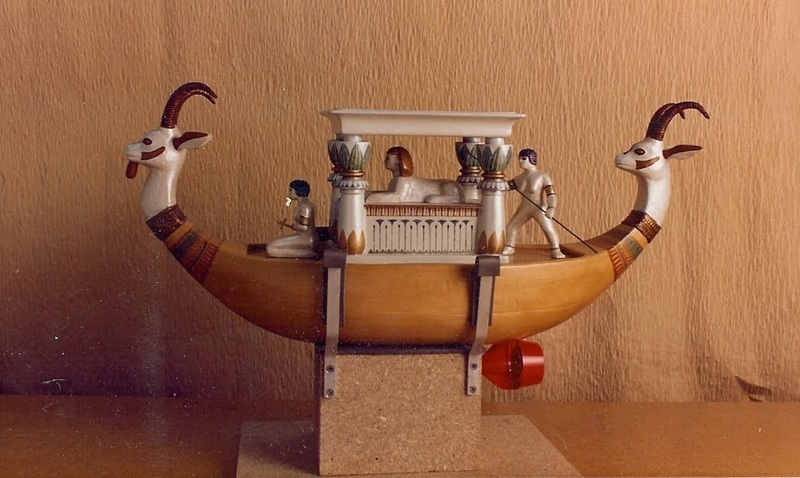 The rest of the modelmakers were all busy on the lacklustre sci fi feature film "Time Guardian" which Mirage were doing all the visual effects for, they were right in the middle of the model shoot in the studio. 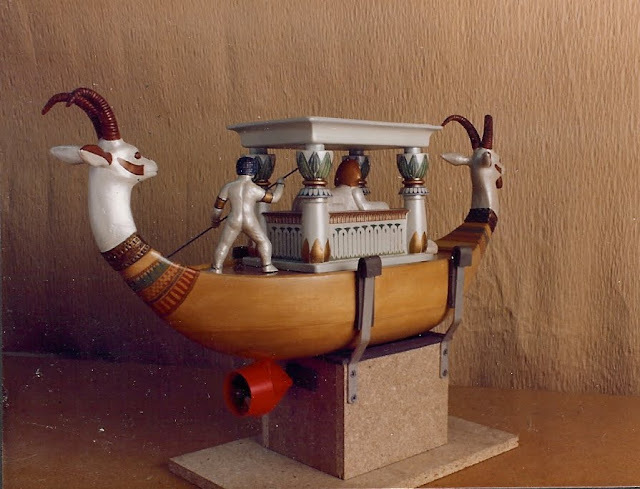 So they hired me and I made a carved Jelutong barge with an ornate Egyptian styled soap dish which was radio controlled. One of the other modelmakers Norman Yeend helped out by doing all the marvelous sculpted figures which adorned the barge and soap dish, a task at which I was not so skilled. For stability I added a weighted keel and for a joke put some wings on it which were a popular talking point at the time, being the period of the famous Australian tilt at winning the America's Cup yacht race.The barge was tested down at the local creek everything worked as expected the batteries were put on charge overnight ready for the shoot the next week. Cleopatra's Barge (soap Dish). Note Marx Kort drive system installed. I had never been on a set or a shoot before in my life and the Mirage chiefs in their wisdom sent me down by myself to the studio. I was frankly rather nervous, and negotiating the Sydney traffic was still very new to me which didn't help. I arrived at the set unpacked all the gear and reported to the set. It was a rather large and lavish set with a pseudo milk filled pool with 4 milk spouts pouring into the water making it all rather turbulent. I put the little barge into the pool and it was being pushed around chaotically by the swirling currents. I had virtually no control over the thing and then to make matters worse I noticed the radio transmitter power level needle was slowly decreasing to nothing. The Nicads, as they were then, had probably sat on a shelf for some time and died a long time ago. I was not to know this of course when having charged and checked them days before they appeared fine. It was an important first lesson in special effects, "have back ups". It made me much better prepared on every job after that. In the end the assistant director Paul Ibbetson who was the partner in the very successful production company shooting the commercial (Ibbetson Cherry) and who also happened to have been the assistant director on Alien, attached a piece of fishing line to the barge below the surface of the pretend asses milk and it was pulled along underwater in every shot. Of course this is how it should have been done in the first place, so much more reliable and a reminder of another important special effects lesson "keep it simple'". For the rest of the day I had to sit there helpless and take all the winged keel jokes and lack of performance gags thrown my way. 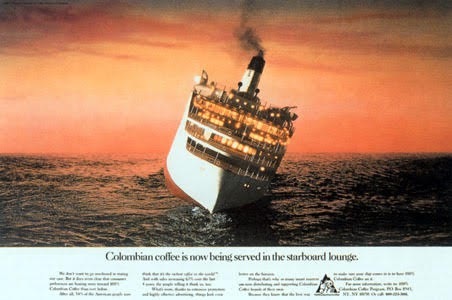 Anyway I digress... the Colombian coffee ship model was loosely based on the liner Britannic. 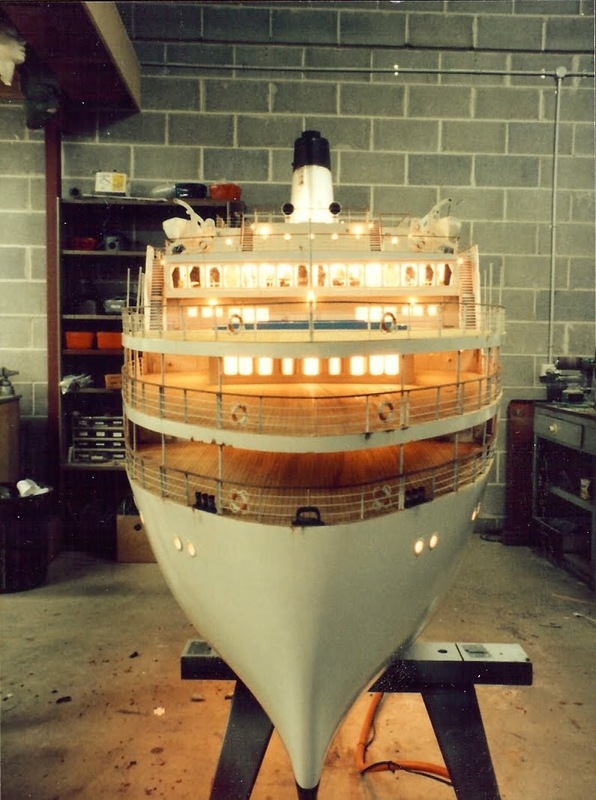 We just built the back third of the ship at 1/35 scale as it was only ever going to be seen from dead on the stern. 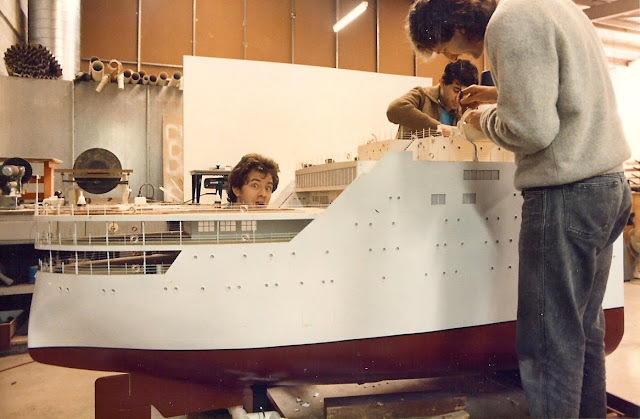 The scale was dictated more by budget than anything else and probably the the cost of building a large tank more than the model ship. The frames were cut out of form ply, which is the waterproof ply used for molding concrete. 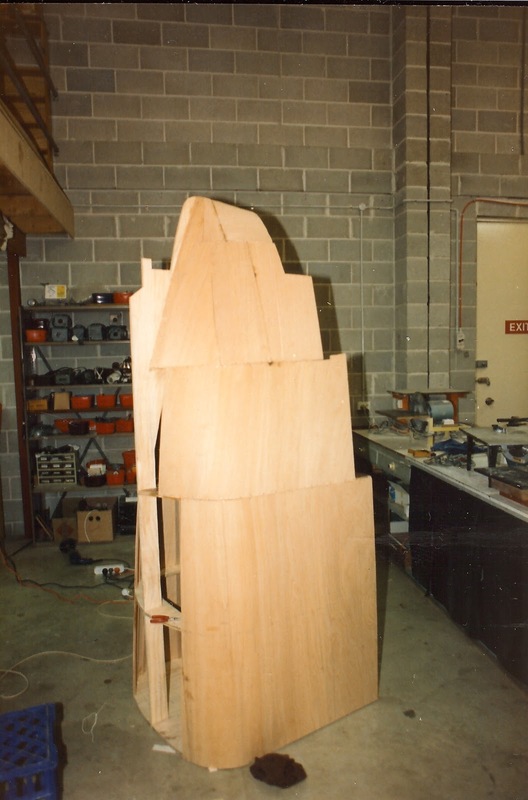 The frames were setup on a keel of the same stuff and then a series of stringers was set into notches in the frames. this was the skinned with 3 ply and faired in with car putty. 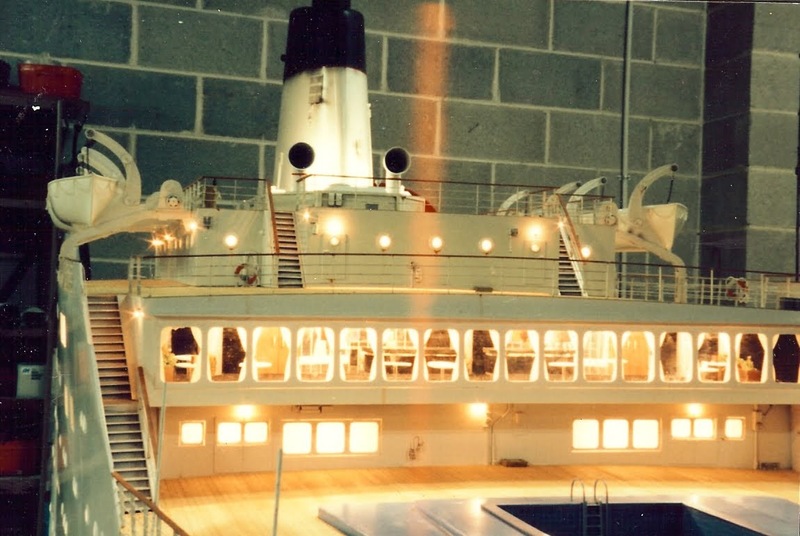 The bottom was built open"British style" as it was going to sit on a steel rig which had a big lever and bowden cable to effect the list to starboard called for in the script and we didn't want to have to fight any buoyancy. Because the inside would get wet all the plywood had to be adequately sealed against immersion for at least the length of the shoot and some set up time which was a duration of a couple of days. 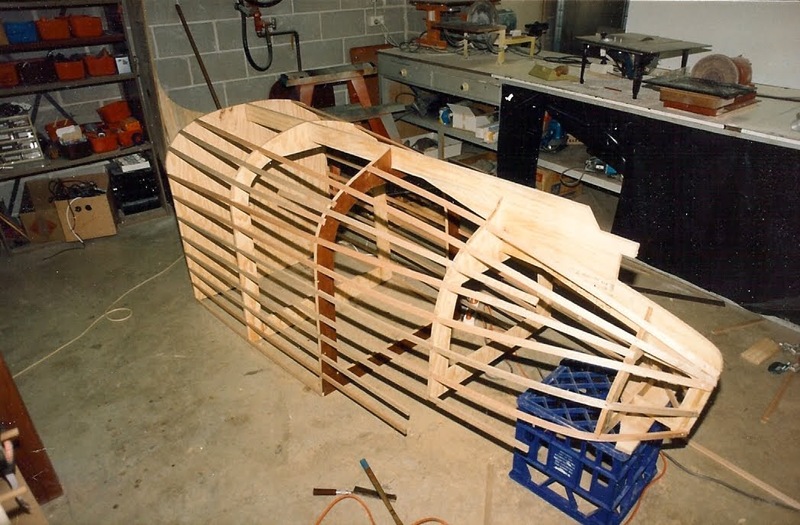 Liberal amounts of car putty was used to fair the plywood where it was tortured into conforming to compound curves. Portholes were large brass eyelets inserted into drilled holes in the plywood. 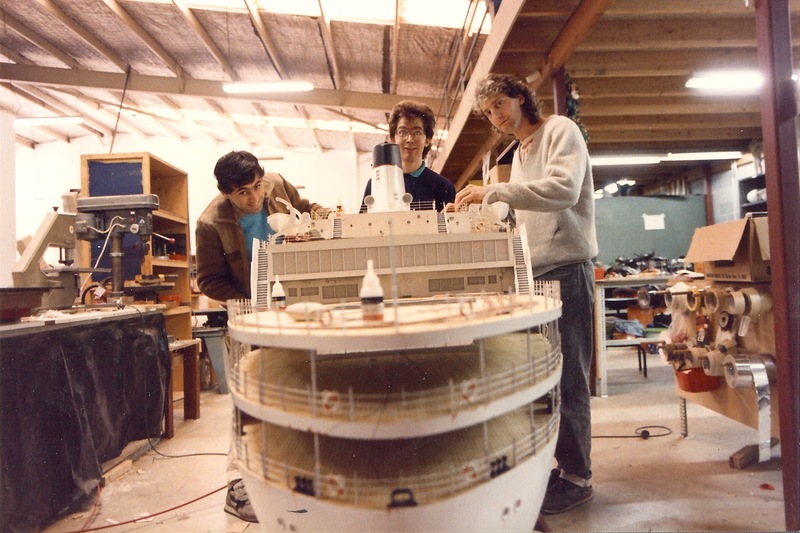 While I was working on the hull Adam Grace was doing the superstructure with Jim Millet and David Tremont working on the details such as the pool, lifeboats, and davits. 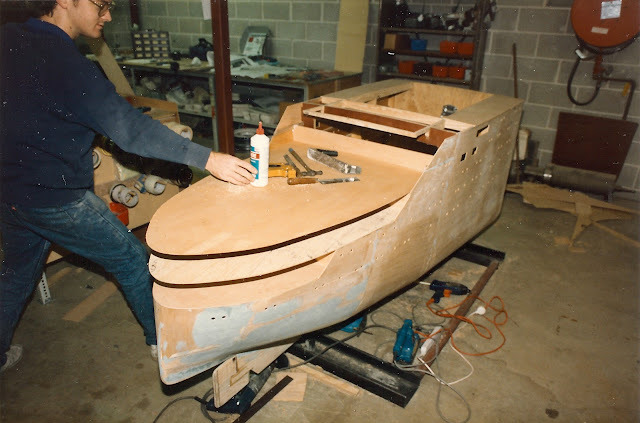 A master was made and a mold taken of the master lifeboat plug and then copies were produced in fibreglass. 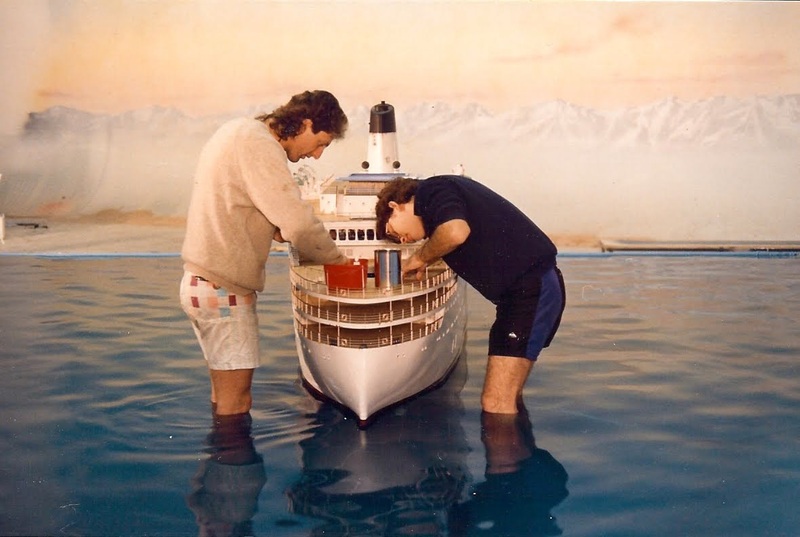 The lifeboat covers were iron on, heat shrinkable model aircraft fabric. I spent at least a week of the 6 week build just wiring up all the 12 volt lighting inside the model. The sources were mostly small globes and the long car interior light bulbs. The handrail stanchions were made of brass and Paul Fardouly who was a toolmaker made a punch and die to stamp out the stanchions from strip brass. The tool radiused the tops, and made a tang on the bottom that was inserted into holes drilled into the decks, in one depression of the press tool. The holes for the rails were drilled out in a jig. The rails were made of piano wire which was very stiff and springy and difficult to thread through the stanchions but made the handrails very resistant to accidental damage. A few model kit parts were added as general detail here and there. We were not allowed to do a weathered paint job being a commercial everything had to be clean , so the model suffers from an fairly unrealistic finish. Adam Grace, Jim Millet working on detailing with me successfully ruining the photo. Adam grace left, Jim Millet right and an idiot in the middle. Jim millet left, Adam Grace right and guess who in the middle. Note the opal perspex top deck windows. 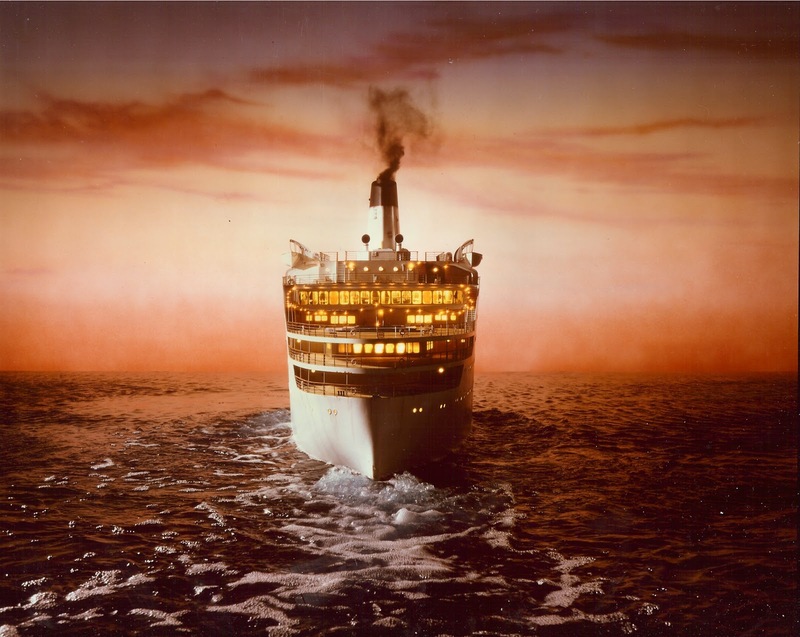 Originally the upper deck just had opal perspex windows which glowed with the internal lighting. 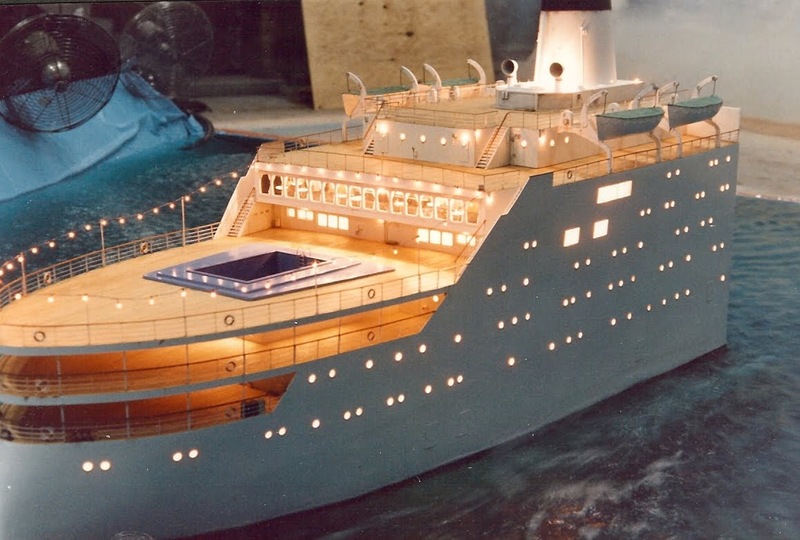 This was modeled after a similar feature on the miniature used in the Poseidon Adventure. At the end of the build period the director took one look at the glowing shapes and said it didn't look any good. I showed him the pictures in my LB Abbott's Special Effects wire tape and rubber band Style book. He looked at the picture and said " yeah but THAT doesn't look real". It's often hard to step back from something you have been working so hard on and see it in the detached manner to objectively judge your work. The powers in charge got all the modelmakers together and in a combined push and at the last minute built an interior cocktail bar complete with glamour decor, tables and chairs and little glasses with drinks. The director was right, it looked a lot better in the end for the interior being visible through the large windows. You can see the hastily built cocktail bar through the clear windows which replaced the original opal perspex windows after the director Peter Cherry's appeal for more realism. Placed at one of the tables with an elaborate cocktail in hand was the Mirage modelmaker's traditional mascot " tumor man". 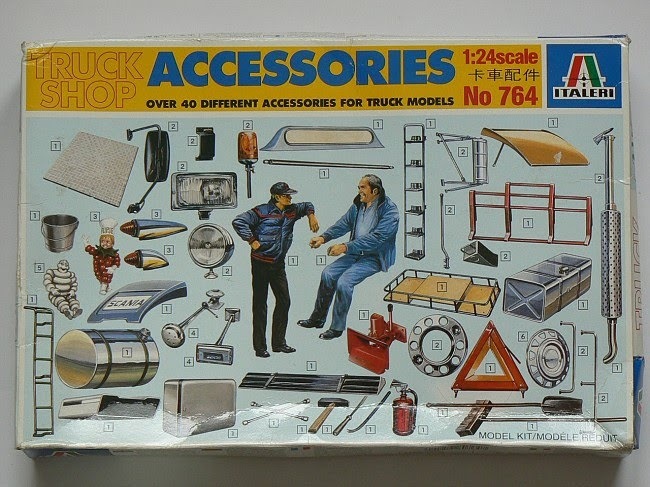 He was a small figure from a 1/25th scale Italieri truck accessories kit. He was actually supposed to be a mascot for, I think, a fruit company and he was like a Michelin man but instead of tyres comprised either a pile of oranges or a berry of some description, I'm not sure which. To the original modelmaker who started it all, he looked like he was covered in a series of lumpy tumors. He was found hidden somewhere on most models that came out of the mirage workshop. There he is, the legendary Tumor man. He's the little fella, looks like a raspberry with in a chefs hat, on the left side of the box. 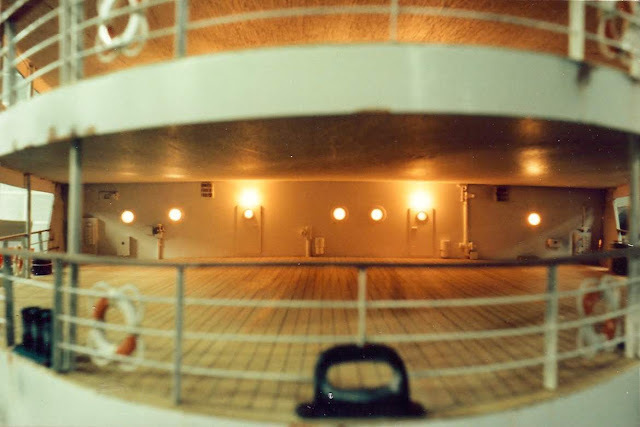 Lower deck detail. Model kit parts used for ventilators and piping. Attached to each side of the steel support rig was some pvc piping painted black which created the prop wash and wake from water which was pumped out the ends. Into this water flow air was injected from a compressor to produce the foaming white water effect of the wake. This made the ship look like it was traveling through the water when in fact it sat still on the spot. The director wanted to see black smoke coming from the funnel. One of the effects guys Wes, did a bit of R&D to see how to produce this and his first attempt used acetylene gas which gives off a sooty black smoke before you normally add in oxygen for metal cutting, brazing and welding. 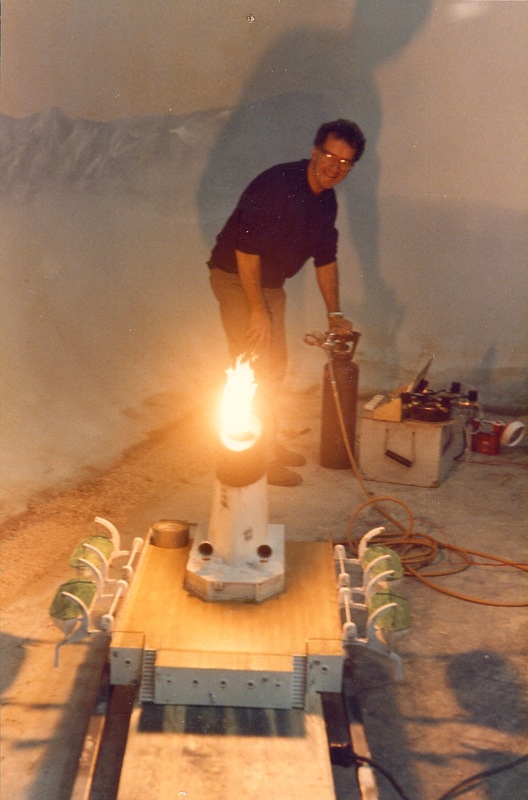 He rigged it up to the funnel, which was made of wooden formers wrapped with very thin ply and had a steel tube down the middle, and managed to produce a mini flame thrower, with a jet of bright orange flame coming up out of the tube. Eventually it was substituted for a pyrotechnic black smoke powder which was mix of naphthalene and black powder. This mix was intended to be used outside in good ventilation, however in our case we were inside a studio and it was set alight inside a steel rubbish bin with a lid on which was then ducted over the back of the tank hidden by the model and up through the funnel. It produced a realistic scale black smoke but as we were to find out was not a solution conducive to good health and safety outcomes. The model was shot at the end of a long day of shooting the live action portion of the spot and then the still photographer turned up to do magazine shots of the model. This was at about 10.00pm. He then re-lit the scene with his still photo gear and had us burning this black smoke over and over for the next 4 hours. I am not exaggerating when I say we were all blowing black soot out of our noses for at least a week after this. Incidentally Wes was nicknamed Wes "the cheese" after a catchphrase " Where's the cheese?" uttered by celebrity chef Peter Russell Clark who used to advertise Australian cheese in the 80's. Wes testing the use of acetylene to produce black smoke. While spectacular, this was not the desired result. A temporary tank was constructed out of form ply with a vinyl pool liner in a wedge shape with the usual overflow horizon. The water was collected from the overflow and pumped back into the tank through the pipes that produced the ship's wake. It is all too easy to underestimate the mass of even a small body of water and during setting up one of the sides of the tank slid back under the load whilst the effects guys were filling it. The water flooded out another set in the middle of filming another Colombian coffee commercial in the same studio resulting in many red faces. Then to cap it off, when the model was being transported to the studio in the back of a tray top ute, the whole top deck which wasn't actually secured flew off landing in the middle of a busy highway. I had to dodge cars to retrieve all the bits some of which had been run over such as the funnel and one of the life boats which was crushed. I was originally going to spend that weekend dressed as a Jendiki warrior along with most of the other modelmakers, standing around in a quarry for some pick up shots for the aforementioned movie "Time Guardian", but it was not to be, as Norman and I had to spend all weekend repairing the damage for the shoot the following week. Adam and I attending to last minute details in the temporary tank. Note that the background painting is left over from a previous production and was replaced with a different sky before the shoot. When you see the shot in the commercial you wonder what all the fuss was about. 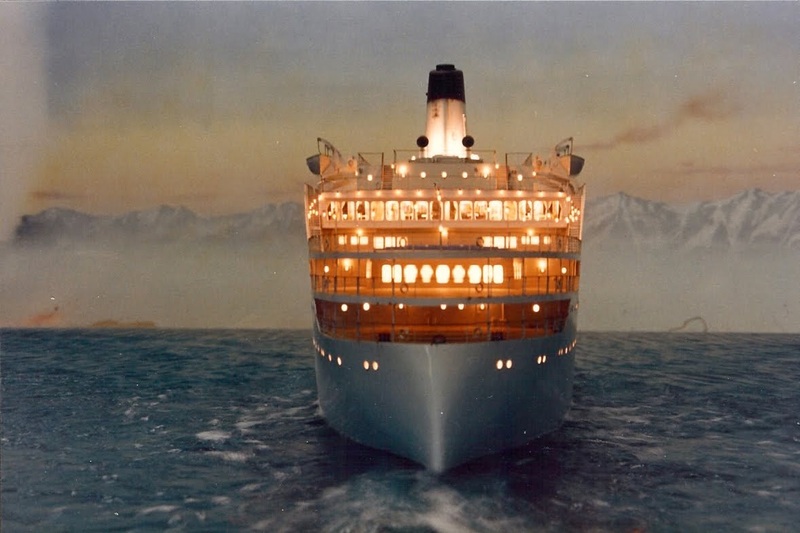 Unfortunately the production company shot the model themselves rather than using Mirage's very competent and experienced miniatures director of photography resulting in, to me at least, a less than convincing effect. At one point we were horrified to hear the camera assistant suggest filming at a low frame rate to make it look better. This was a not an uncommon problem. In inexperienced hands the best model can be lit and shot in such a way as to make all the effort at scale accuracy little more than an academic exercise. A reject photo from the still photographer. You can see a flat spot on water surface on the left of frame where the fan has not got up to speed, but look at all that lovely black smoke. The final magazine image with the list to starboard. The model sat up on the mezzanine floor of our workshop for a couple of years and then when we closed our workshop to go and work on a series of Ultraman in 1989, we gave it away to another modelmaker who was going to sell it to a restaurant to perhaps mount on the wall. I have no idea if he ever managed to sell it or what ever happened to it. Colombian Coffee model crew Mirage Effects - Adam Grace model shop supervisor, Jim Millet, David Tremont, David Rutherford, Norman Yeend, Paul Fardouly, Wes "the Cheese" ( I never knew what Wes's surname was). FX supervisors were Tad and David Pride. One other anecdote from the shoot was that the main actor in the spot was Shane Briant who was notable for starring in some classic Hammer Horror films of the seventies. "police arrive moments later and scan the area for the fugitives, they see only the back of a tram, pulling away into the distance. However, when we see the front of the tram, it is revealed to be Malcolm's custom-made mini-tram". Sorry about this but I have to ask - were you glad to see the back of that Columbian coffee commercial?